Spicy and sour soup, rich in seafood aroma. Boil 4 bowls of water with 3 stalks of lemongrass for 8 minutes. Small Flame. Add Tom Yum Paste and tomatoes. Boil and stir until aromatic. Add in the prawns for 3 minutes, or as soon as the prawn turn red. Remove prawns and set aside. Add in mussels. Remove the mussels once the lips open. Set aside. Add in sliced fish and sliced sotong and let them cook for 2 minutes. Prepare to serve. 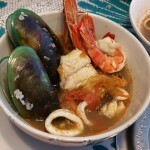 Before serving, add in the cooked prawns and cooked mussels.